We’d love your help. Let us know what’s wrong with this preview of Teach Me To Serve by Kristen Tiber. Do you want your preschooler to have a heart to serve others? I’m willing to bet that you have great ambitions for your children. You work to raise children who are kind, friendly, hard-working and all-around “good” people. But have you given consideration to developing the characteristic of a servant’s heart? As a parent, you can be DELIBERATE in providing various opportun Do you want your preschooler to have a heart to serve others? I’m willing to bet that you have great ambitions for your children. You work to raise children who are kind, friendly, hard-working and all-around “good” people. But have you given consideration to developing the characteristic of a servant’s heart? As a parent, you can be DELIBERATE in providing various opportunities for your children to serve others. Even a preschooler can learn to have heart for others and follow Jesus’ example of servanthood. This isn’t a curriculum, nor is it a book of crafty ideas. 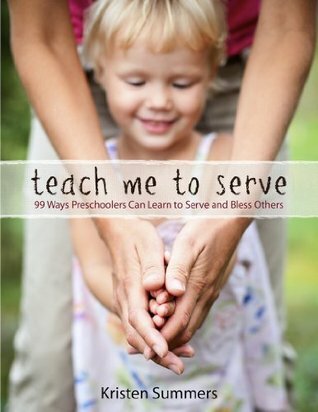 "Teach Me To Serve" contains 99 practical tasks in which your preschooler can learn to serve in their home, neighborhood, community, church and even the world. Discover why we serve and how you can lead your child through the process of developing a heart for others. To ask other readers questions about Teach Me To Serve, please sign up. Not very revolutionary or helpful. The ideas were pretty standard. Very practical way to teach our thing ones to serve. Certainly, one could even use this book to improve their own service as well as teaching it to children.